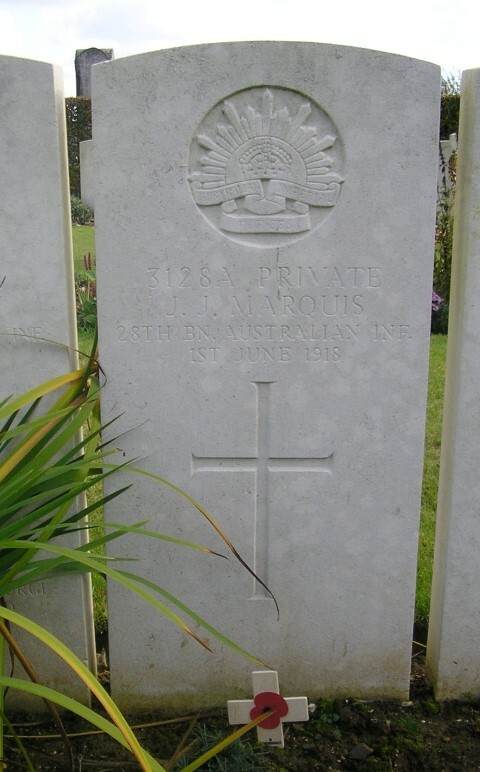 3128A Private John Joseph Marquis, 28th Battalion, Australian Infantry, Australian Imperial Force was killed in action 1 June 1918 and is buried at Franvillers Communal Cemetery Extension, France. He was 24 years old and is commemorated on the Hamsterley War Memorial, the Katanning War Memorial, the Roll of Honour, Katanning Town Hall, the Perth War Memorial, Western Australia and the Australian War Memorial, Canberra. John’s brother 5893 Private Fredrick William Marquis, 28th Battalion, Australian Infantry, Australian Imperial Force died of wounds 4 September 1918 and is buried at Heath Cemetery, Harbonnieres, France. In 1901 the family lived at Hamsterley where 43 years old Henry was a grocer/tea dealer (own account). In 1909, the family emigrated to Australia on a passage through London to Freemantle, Western Australia. Henry was 51 years old at the time and Eleanor, 45. 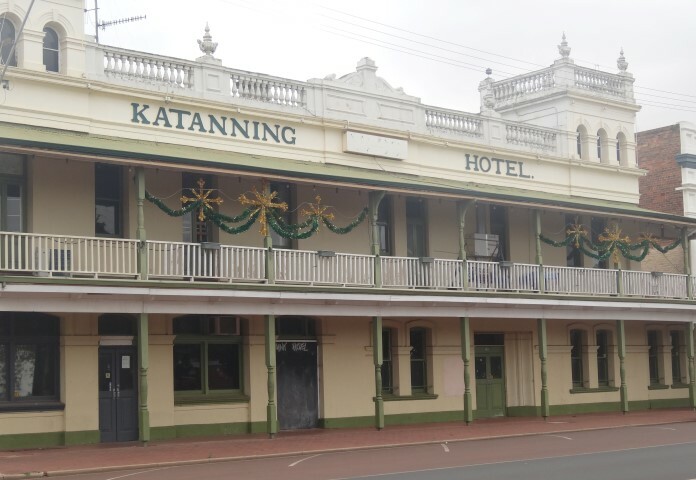 In 1910, they took up land at Datatine in the Shire of Dumbleyung, Western Australia. 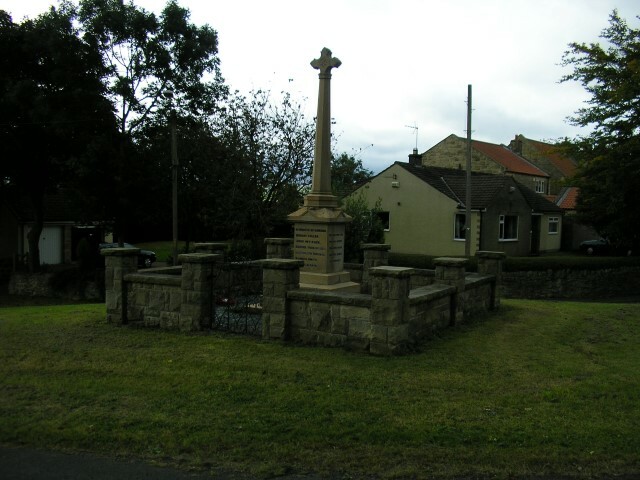 The farm was called “Hoppland Park” presumably after the similarly names historic grounds near Hamsterley, Co. Durham. 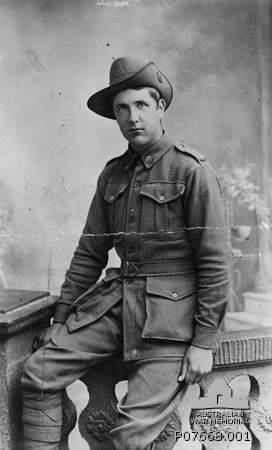 1 August 1916: Private J.J. Marquis joined the 28th Battalion, AIF and was given the regimental number 3128. The 28th Battalion AIF (Western Australia) was raised in April 1915 and took recruits from Western Australia. During the course of the war 22 draft reinforcements sailed from Freemantle to join the battalion. It came under the orders of the 7th Brigade, 2nd Division, Australian Imperial Force (AIF). 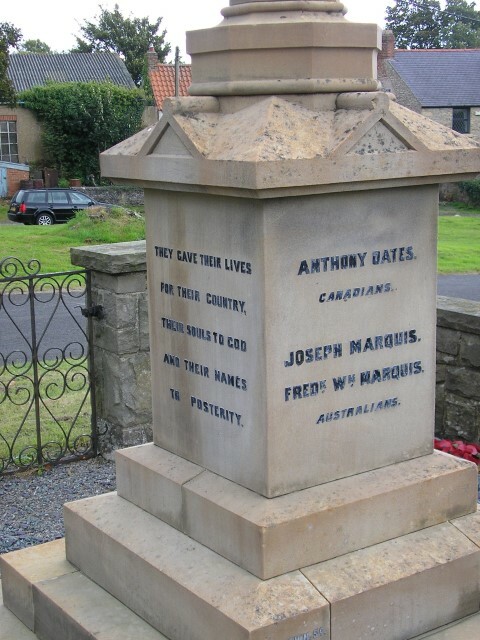 The Battalion departed Freemantle for service overseas 29 June 1915 and after 2 months spent in Egypt training, landed at Gallipoli 10 September 1915 The 28th had a relatively quiet time at Gallipoli and the battalion departed the peninsula in December, having suffered only light casualties. After another stint in Egypt, the 7th Brigade proceeded to France and the Western Front. The 28th Battalion took part in its first major battle at Pozieres between 28 July and 6 August 1916. After a spell in a quieter sector of the front in Belgium, the 2nd Division returned to the south in October, where the 28th Battalion took part in confused and costly fighting to the east of Flers, in the Somme Valley. For many of the major battles of 1917 the 28th Division was in supporting roles. At the Second Battle of Bullecourt, it provided reinforcements who were nonetheless involved in heavy fighting. The 28th took part in the Third Battle of Ypres, the Battle of Menin Road, capturing its objectives in seven minutes. It was in reserve during the capture of Broodseinde Ridge. The battalion was also in reserve for the Battle of Poelcappelle on 9 October but with the attack floundering in mud; it soon became embroiled in the fighting. In April 1918, the 28th fought to turn back the German spring offensive and 8 August participated in the joint British and French offensive that marked the beginning of Germany’s defeat. 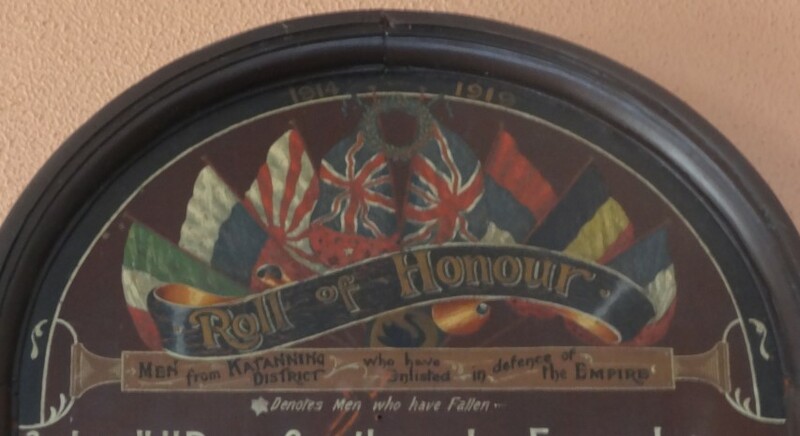 The Battalion was prominent in the fighting to secure crossing points over the Somme River around Peronne, and in the advance beyond Mont St. Quentin. The 28th Division’s last actions of the war were fought as part of the effort to break through the Beaurevoir Line in the first week of October1918. The first members of the battalion began returning to Australia in January, and the 28th was disbanded in March 1919. 26 October to 10 November 1917: The 2nd (Australian) Division was involved in the Second Battle of Passchendaele. The battalion saw action at Broodseinde, between 27 and 31 October, 1 officer and 13 Other Ranks were killed in action, 1 officer and 17 Other Ranks were wounded, 1 officer and 28 Other Ranks were gassed, 1 Other Rank died of wounds later and 2 Other Ranks later died of gas wounds. It is highly likely that Private JJ. Marquis served here. May 1918: The Division was posted near Merricourt, Somme, France. 18 May 1918: The 6th Brigade attacked Villers sur Ancre, the 28th Battalion was in support. 20 May: it relieved 22nd Battalion in the line. 25 May: it was relieved by the 25th Battalion. 1 June 1918: The Battalion was in Divisional Reserve and at midnight 31 May/1 June, it was relieved by 22nd Battalion. On being relieved, the companies marched to La Houssoye and “B” Company was attacked by an enemy plane. It dropped 2 bombs killing 27 Other Ranks, wounding 1 Officer and 39 Other Ranks. The bodies were buried at Franvillers Cemetery. Private John Joseph Marquis is buried at grave reference I.D. 19 Franvillers Communal Cemetery Extension. Franvillers is a village located between Amiens and Albert and stands on high ground above the river Ancre. The communal cemetery was used between May 1916 and May 1918, the extension was used from April to August 1918 by units and field ambulances engaged in the Amiens District. It contains 248 Commonwealth burials. The Australian 2nd Division Memorial: The original memorial depicted a digger bayoneting a German eagle was erected in 1925 but it was removed by the Germans during 1940. The current memorial dates from 1971 and is located on the side of the Bapaume to Peronne road in the village of Mont St. Quentin. The Katanning War Memorial was paid for by public subscription and unveiled 25 April 1921 (ANZAC Day) by General Bessell-Browne CB.CMG.DSO.VD. Australian War Memorial RCDIG 1017396: 28th Infantry Battalion War Diary May 1918 Appendix 36; Report 1.6.18 In the Field Capt. Harper R.M.O. 28th Battalion A.I.F.